If you are having a party, recipes for easy appetizers are something that you will want to have on hand as go-to recipes. 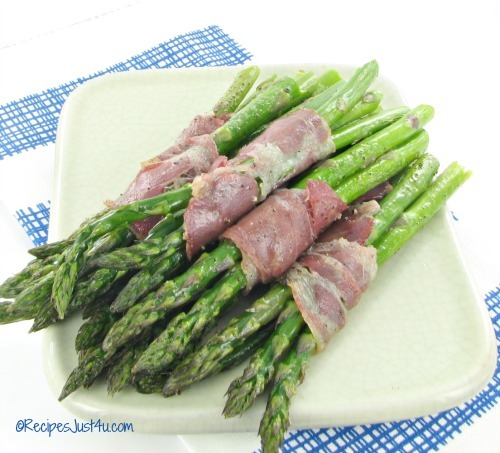 This easy bacon wrapped asparagus recipe makes a great party starter and is also a great side dish for any regular meal. I love healthy side dishes that still have a taste of decadence about them. This recipe is one that fits that bill nicely. 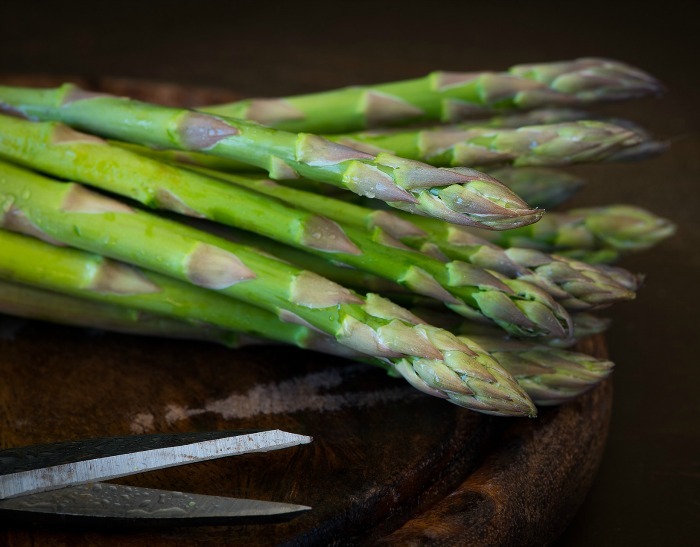 Asparagus is very quick to cook, but steaming it doesn’t get the best flavor from the vegetable. I like to roast mine. Doing this brings out the natural sweetness to any veggie and asparagus is no different. It only takes a few minutes longer in the oven too. Be sure to trim your asparagus. Most of the time, this veggie still has the ends on it that are really too firm to cook well. I just grab a bunch of it and snap them at one time. It will break at just the right point to give you tender, juicy stalks. I line a baking sheet with a silicone baking mat. (affiliate link) It makes the clean up much easier. You can also use parchment paper. Next comes the bacon. Other types of cured meats also work well, such as proscuitto, or capocollo. I used capocollo for this recipe but have done it with the other meats too. You can wrap each piece individually, or do them in bundles. I am trying to lose weight, so I use four or five stalks together (depends on thickness of the asparagus), and then wrap with 1/2 slice of the cured meat. I don’t find that I need toothpicks as long as I wrap them firmly. If you are planning on serving these as appetizers, it is best to wrap them individually. 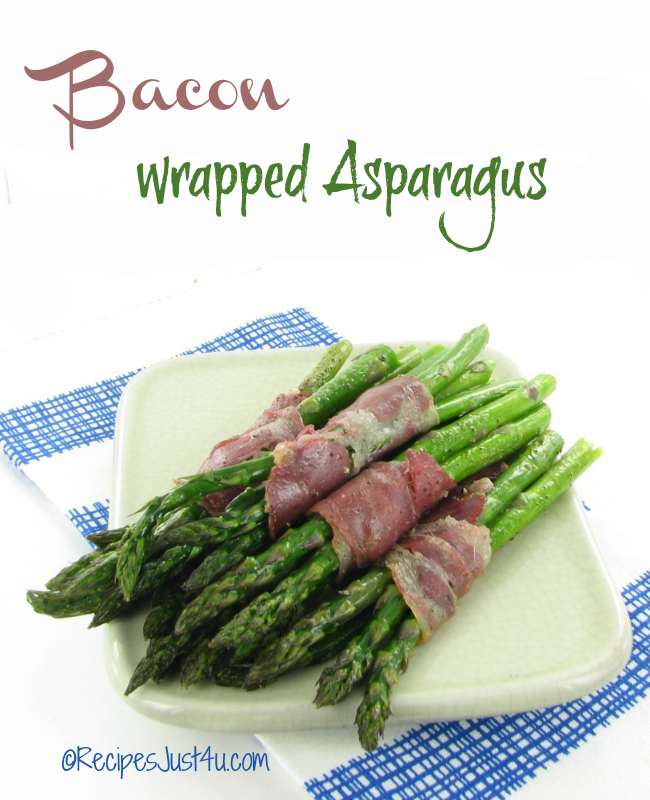 One of the great things about this recipe for bacon wrapped asparagus is that it can be made ahead of time. Perfect for party appetizers! This recipe is good with so many dishes. From a plain grilled steak, to a more time consuming entree, it will compliment your recipes beautifully. Bacon (amount depends on whether you plan to wrap them individually or in bunches) Check your labels to make sure the bacon is Whole30 compliant. Preheat the oven to 400º F. Line a baking sheet with a silicone mat or parchment paper. Trim the asparagus and separate into small bunches. (you can do them individually if you wish) Wrap each bundle (or stalk) in 1/2 slice of the cured meat. Place on the baking sheet, and season with cracked black pepper. Drizzle with the olive oil and bake for about 15 -20 minutes, until the bacon starts to crisp.